Combine Sherlock, Castle, and Torchwood and what do you get? 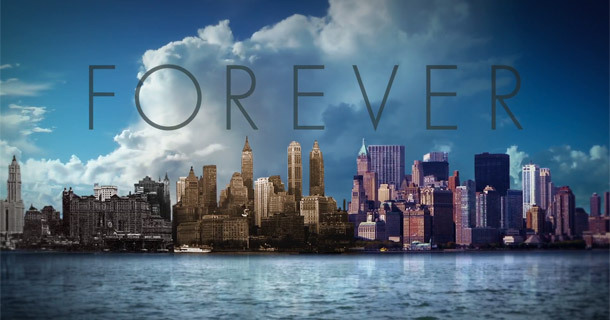 A great new US show called Forever. In this vampire-crazy time we live in there’s been a ton of books, shows and films come out dealing with the topic of immortality, most exploring what humans become when they can live indefinitely. Forever, on the surface, sounds like just another one of these; guy who can’t die and his adventures in New York. But Forever is so much more than this. Dr Henry Morgan (Ioan Gruffudd) has been alive for about 200 years. Something unexplainable happened to him when he was a doctor on a slave ship, and he contracted a case of immortality with a twist. Henry can die, but when he does, he re-awakens shortly after – always in water, and always naked – with all his memories still in tact, including the details and very real pain of how he died. A little bit like Captain Jack Harkness (hence the Torchwood resemblance); he’s the man that cannot die (permanently). This curse, as he calls it, has given Henry an interest in death (from a research perspective) and a Sherlock-Holmes-esque power of deduction, which he uses to the bafflement of his colleagues in his job as a medical examiner, often figuring out before commencing an exam how a person died. This is a skill that is of great use to Detective Jo Martinez of the NYPD (Alana de la Garza, who is seriously channeling Kate Beckett from Castle). Det. 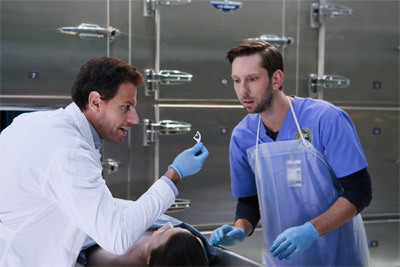 Martinez meets Dr Morgan during the case in the first episode, which turns quickly from accident to 15-person homicide, thanks to Dr Morgan’s deductions. While at first being frustrated at Henry for creating more work, perplexed at his odd, slightly incriminating behaviour, and being a bit hungover, Jo’s determination to find out the truth about a case, not just close cases, means that she continues to associate with and consult Henry after the initial case is closed. 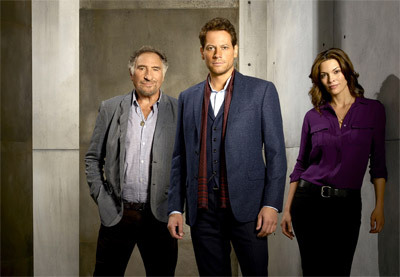 Each episode of Forever presents itself as any other crime drama does (and in saying that; only two are out at time of writing); there’s a dead body, a mystery, and it’s Henry and Jo’s job to figure out what happened. Our overriding story arc; the hook that makes Forever different from all the other crime dramas out there is Henry’s curse; his struggle to hide what he is, so that he can protect both himself and his friend Abe (Judd Hirsch) and live as normal lives as possible under the circumstances. There’s a ton of mystery surrounding how exactly Henry obtained immortality. We are treated to snippets of Henry’s life, via timely-placed flashbacks, where we experience a portions of his life, particularly those that he shared with a woman called Abigail (MacKenzie Mauzy), who he still has not gotten over. The circumstances of her departure from his life are clearly something that will be delved into over the series; was she killed, did she leave, or did she just die of old age (something that’s a bit Doctor Who – the Doctor watching his companions come and go while he remains)? Henry’s inability to allow anyone into his life apart from Abe seems to stem from the loss of Abigail; a hesitancy that frustrates his colleague Lucas (Joel David Moore), who tries several times to be sociable, and several other times to point out that they’ve worked together for three years and never really talked. The other mystery arcing over Forever surrounds a man who seems to have discovered what Henry is, who is watching him for reasons unknown. Henry’s been discovered before – had his blood drained and been burnt as a heretic among other things, as people tried to wrench the secrets to immortality from his body. But after initially responding to the threat of exposure the way he usually does – by panicking, planning to leave and set up anew with Abe somewhere else in the world – Abe convinces Henry that they should stay this time. So they stay, and the mysterious man who has been researching Henry’s past continues to send messages and make phone calls, all containing supposed clues, but never giving away what he actually wants, in a very Professor Moriarty way. This is a show that really surprised us and we’re hooked, eagerly awaiting the next episode so we can keep watching this fascinating story unravel. While being full of flashbacks and voiceovers – Ioan Gruffudd does both really well. The voiceover has been written into Forever properly; it compliments the action, as opposed to leaving you screaming at the screen saying “show don’t tell!” like some other shows *coughOutlandercough*. The flashbacks are timed in a way that is both relevant to the current episode and also contributes to the main series story arc, compliments the pace of the modern timeline, and works with the flow of the individual episode’s story. It feels like the writers behind this show really know how to tell, and reveal, a story in a truly engaging way. Forever was created by Matt Miller, whose previous work I’m not familiar with. But the writing is snappy and truthful; Ioan Gruffudd is the perfect pick for Henry, with this appropriate agelessness about him, and he injects a lively energy into Dr Morgan – the delivery of many of his lines has left us chuckling, in a good way. And while I’ve never seen Alana de la Garza in anything before, her portrayal of the grieving Jo Martinez feels more real than the majority of grieving widow characters that are spun into existence. The supporting cast are fantastic, and easily recognisable; seeing both Judd Hirsch and Joel David Moore surprised me; they’re movie actors – what are they doing in a TV show? But once you get into the show (which doesn’t take long), it’s easy to see why; the story, and the characters, are brilliant – nuanced from your regular crime-show fare. I’m going to make a rather large call after just seeing two episodes, but that’s how hooked I am; Forever just may be my new show of the year.